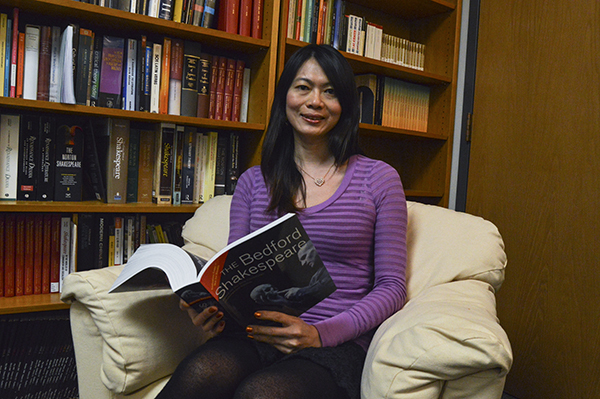 Alexa Huang, a professor of English and director of the Dean's Scholars in Shakespeare program, studied the role of minorities in Shakespeare productions for a new book. She is also writing a second book focusing on Shakespeare in Asia. An English professor wants more people to know about “meaningful diversity” in Shakespearean theater. Alexa Huang, a professor of English and director of the Dean’s Scholars in Shakespeare program, is releasing a book about actors of African and Asian descent performing Shakespeare in the U.S. and Britain – a work she said will shed light on the issues of typecasting that she says minority actors often face. Huang received a Fulbright Scholarship in 2014 and spent the year in London, where she began researching for the book and interviewed black, Asian and “multi-ethnic” actors who performed there. “If white actors do Hamlet, you don’t see whiteness because you think it is the default. I would like to raise the awareness so that people begin to see race, not just people of color, but to see white as a color,” Huang said. She said she is focusing her book on how Shakespeare might come across as more exotic to audiences because of the actors’ ethnicities, she wrote in a blog post about her travels. Huang said she is also working on a second book about Shakespeare in Asia, which focuses on the way Shakespeare’s plays have been adapted in China, Japan, Korea and Taiwan. Both books have been contracted but release dates have not yet been announced. Huang said she anticipates they will be released in 2017. She said she wants people to rethink their assumptions of how characters should look, especially as white actors dominate theater in the U.S. and Britain. Many minority actors have a hard time breaking away from roles specifically written for people of their ethnicities. “They may look different, they may be a minority, but they are interested in doing mainstream theater,” Huang said. Huang, who has studied Shakespeare for the past 10 years, said meaningful diversity can bring attention to racial issues by exposing audiences to culturally different adaptations of Shakespeare. She added that for diversity to be meaningful, it must be engaging – a quality she thinks Shakespeare can provide because of its cross-cultural themes. Huang said that the same unique cultural perspectives that often lead to typecasting can allow minorities to contribute a great deal to Shakespearean adaptations. She said she hopes readers will be willing to explore the uncomfortable issue of race in Shakespeare.